Did you know that Borax is actually a mineral, found first in Tibet? Today, it’s sold all over the world in the laundry and cleaning sections of the grocery store. Over the years, people have found dozens of uses for it which include the very basic and even some bizarre things. It’s antifungal, antibacterial, chemical free, environmentally friendly and can do some pretty amazing things around your home. Today, I’m sharing some ways you can use Borax around your home. 1. Laundry Booster. This is perhaps the most well-known use for Borax. A cup of Borax added to laundry with detergent will make your whites whiter and get out more stains. If you use a stain removing spray like Shout, a little bit of Borax added to the bottle will make it more powerful. 2. Dishwasher Detergent. Slash your budget by making your own! One tablespoon of Borax, one tablespoon of baking soda, and one teaspoon of lemon juice used in place of dishwasher detergent will make your dishes clean and sparkly. 3. Mold Cleaner. Using a solution of one cup of Borax to one gallon of warm water, spray it on mold, leave for a few minutes, and then wipe off. 4. Odour Remover. If a little one had an accident in the bed in the middle of the night, rub Borax on it and let it dry. Then vacuum it up. The odour will be gone. 5. All-Purpose Cleaner. Make an all-purpose cleaner by mixing 2 tablespoons of Borax and 2 cups hot water in a spray bottle. Add a little bit of lemon juice for a fresh and clean scent. 6. Pest Killer. Sprinkle Borax on your carpet and leave it there for an hour to sit. Then, vacuum it up to kill fleas. The same goes for bedbugs. Sprinkle on your mattress; leave it for an hour or so, and then vacuum. To kill ants and roaches, mix equal parts of Borax and natural sugar and put them wherever you think they’re hiding. They’ll bring it back to their nests and upon ingesting it, the colony will die. 7. Mouse Deterrent. Sprinkling Borax around the perimeter of your home to keep mice from coming in. Note: You want to make sure there are no mice in your home when you do this or it will also keep them from going out. 8. Rust Remover. One cup of Borax combined with two cups of warm water and one tablespoon of lemon juice removes rust. Simply brush on, leave a few minutes, and then wipe off. This is a great way to revitalize old pots and pans. 9. Unclog Drains. First, get as much water out of your drain as possible. Then, pour ½ cup of Borax down the drain and follow with 2 cups of boiling water. 10. Dry Flowers. One part Borax mixed with two parts corn meal dries flowers. Put them in a shoebox and they will dry out without wilting. This is a great way to preserve things like wedding corsages. You can even use Borax for some health and beauty issues. (Note: I have not tried this myself, so please use due diligence and do your research before attempting this!) A solution of ½ cup of distilled white vinegar and 1 tsp borax 10 minutes a day is used by some people to cure toenail fungus. As you can see, there are several different uses for this seemingly magical mineral. Borax is a great substance to use in various science projects with the kids as well. Next time your child comes home with the letter from the teacher about the science fair a day before it’s supposed to happen, you’ve got it covered! How do you use Borax in your home? I never put Borax to use here…..now I want to try it! Wow! That’s so many amazing and important uses. I really like that it unclogs drains. I currently use Liquid Plummer and it’s getting expensive. Thanks for the tips. I’ve used borax before for an ant problem in our house, but it’s great that there are so many other uses! I like that it cleans mold, and I need to get the Borax and pour around my house to keep out the mice. I have not had any for a long time, and I like that this keeps the mice out of my house! And it also unclogs drains? I need to use it for my drains. I’ve heard and seen borax in the store but had no idea what it was or what you can you it for – wow I’m amazed and excited to try it!!! I use a little when I make bath salts. Funny about the mice. Borax sounds terrific, I’ve never used it, so will have to buy some & check it out, thanks very much for the info. I haven’t used it yet but I just bought a box. Thanks for the ideas. I’m going to try the all purpose cleaner first. Some great ideas, love the one for the mice!! 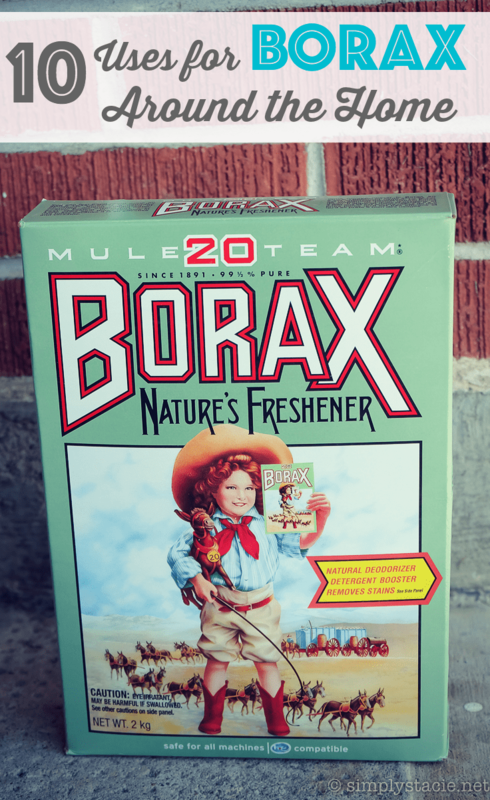 I love Borax especially for my guys work clothes, it really helps get them clean. I also use it as ant poison. Now I have more ideas, thanks! Wow- I did not realize it had so many uses other than laundry. Thanks for this great article!